Planning to attend a local festival can add an extra dimension to your trip. Participating in festivals has been described as 'like standing inside the mind of a culture as it dreams'. Planning to attend a local festival can add an extra dimension to your trip. Participating in festivals has been described as 'like standing inside the mind of a culture as it dreams'. Here are some suggestions for dreamy festivals around the world in 2015. Looking for something a little different, not to say downright weird? Then this Spanish festival may be for you. While your friends may try running with the bulls in Pamplona, or fighting with tomatoes at the Tomatina in Valencia, you can be pelting a devil with turnips on the streets of Piornal in Central Spain. The Jarramplas is a devil-like character who walks the streets and is attacked by townsfolk hurtling 15,000 turnops to symbolize the expulsion of everything bad. St Sebastian Day: January 20. Time your visit to the lunar cycle and head for the crescent beach of Haad Rin on Koh Phangan Island in southeast Thailand. Here travellers from around the world gather to party until dawn in beach clubs and with some of the best DJ's around. It's crazy, it's chaotic and it's incredible. Survivors get the bonus of a spectacular dawn. Monthly. Of all Mexico's many festivals, Dia de los Muertos, or the Day of the Dead is perhaps the one that most vividly fuses the pre-Hispanic cultures and Roman Catholic beliefs. It is a head-spinning phantasmagoria of markets, processions, foods and celebrations. And there's nowhere better in the country to experience this explosion of Mexican culture than the mountain city of Oaxaca. Time your visit for Nov 1st and 2nd. 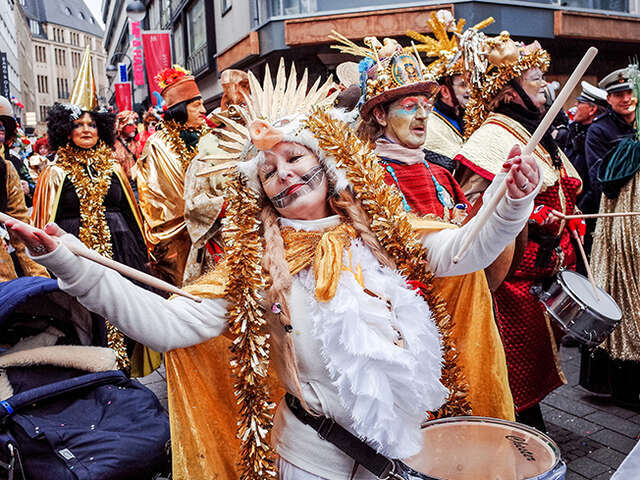 The Carnival in Cologne, Germany is known as the 5th season of the year or "crazy days". Carnival season starts on November 11 at 11am where the mayor hands over power to a prince, a peasant and a maiden. Everyone dresses up just like Halloween and there are big street and ghost parades all around the city. The big carnival wagons are filled with sweets and spectators call out "ALAAF" (which means 'Cologne above all') to ask for sweets to be thrown.